BROOMFIELD, Colo., Oct. 18, 2018 /PRNewswire/ -- Ball Corporation (NYSE:BLL) and One Energy Enterprises LLC announced plans today to build three additional wind turbines to provide power to Ball's Findlay, Ohio, beverage packaging plant. The three new turbines will join three similar turbines that have been in operation since December 2015. 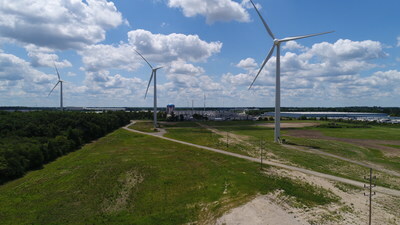 Together, the six turbines will use sustainable wind resources to supply approximately 30 percent of the Findlay plant's power needs at a fixed cost for 17 more years (the initial three turbines) and 20 years (the three new turbines). The Findlay plant, which employs more than 370 people, makes 100-percent infinitely recyclable metal containers. "Ball's sustainability progress is powered by projects throughout our company, and our expansion of the use of wind power in Findlay is yet another example," said Glenn Jost, the company's Findlay plant manager. "By expanding our use of wind turbines to deliver power to our plant, Ball is increasing its support of renewable energy while ensuring a fixed-rate cost for a significant amount of our Findlay power needs for decades. This adds to the sustainability advantage of metal packaging compared to other substrates, like plastics and glass." The three new turbines, which will begin construction by the end of 2018, will be the same model of turbines that were used for Ball's previous turbine project in Findlay. The project cost is approximately $9 million and is being financed by One Energy. The six total turbines will generate more than 24,000,000 kWh annually. To further increase community impact, Ball and One Energy will create three, additional $5,000 Megawatt Scholarships in Findlay to be awarded each year the turbines are in operation. These Ball Corporation/One Energy STEM Scholarships will annually hand out a total of $30,000 between the 6 scholarships. The Megawatt Scholarships will be awarded to local high school graduates pursuing a two-year or four-year higher education degree in science, technology, engineering or math (STEM) fields of study. "Support of STEM education is critical to Ball's ability to provide products that help sustain our planet," said Jost. "The critical importance of STEM learning – particularly for disadvantaged students – will be key to ensuring companies have the talent they need to thrive. That includes our efforts to further develop our Findlay workforce pipeline for engineering positions, and for other STEM roles at Ball."